About 7:00 p.m. in the evening on September 28, 1888, an unmanned balloon came down in a cusp of trees on the Razee Farm in the Cumberland Hill area of the town of Cumberland, Rhode Island. The craft had some signs of age to it, and was in poor condition. The seams along the balloon measured 40 feet 6 inches. The ropes attached to the balloon’s netting appeared old, but the netting containing the balloon appeared to be new. The balloon’s iron ring was two feet in diameter and made from a welded piece of 1/2 inch gas pipe. Nobody knew where the balloon had come from, or if an aeronaut had met with misfortune. Severe weather had been over southern New England the day before and it was wondered if that could have played a role. Carl Myers was well known in balloon circles at the time, for besides being an aeronaut, he was also a scientist, inventor, and manufacturer of man-carrying balloons which he built and sold from his “balloon farm” in upstate New York. When contacted about the balloon found in Cumberland he said he knew nothing about it, and offered that it might be one he’d sold. The only balloon he’d “lost” was at a July 4th exhibition in Willimantic, Connecticut, but it had been recovered in southern Rhode Island. Advertisement from The United Opinion newspaper of Bradford, Vermont, June 17, 1887. The ad was promoting the Lyndonville, Vt., July 4th Celebration. 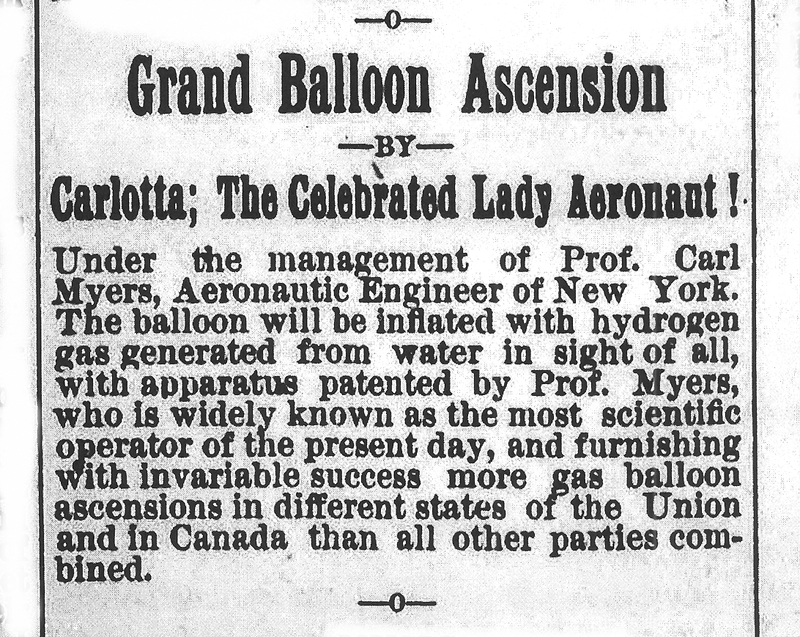 Myers wife, Mary, was also a well known aeronaut who went by the professional name of “Carlotta”. 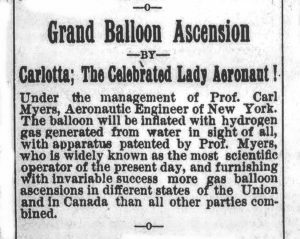 On September 26th Carlotta and a man she worked with, Leon A. Dare, were to have participated in a balloon race at Syracuse, New York, and on September 28th Carlotta was to have made an ascension at Lockport, New York. Both Carlotta and Mr. Dare were found to be safe, and unconnected with the balloon found in Cumberland. Famous Rhode Island aeronaut, Professor James Allen of Providence, went to the Razee Farm to offer his opinion. Allen noted that the balloon was made of cotton cloth and not silk. Measurements revealed that the balloon was 27 feet in diameter, which would give it a gas capacity of 8,000 cubic feet, thereby making it large enough to only lift the weight of one person during an ascension. Allen speculated that based on how the ropes were attached, and the fact that there was no anchor or drag rope, the balloon may have been used for trapeze work, and that the performer may have fallen during an exhibition, or landed at some location where the balloon then escaped. If it had been filled with hydrogen gas then his theory was plausible. No further details were given, and thus far research has failed to find any. The news item states “Freehold, N. J.” but based on what was reported earlier about the American Express tag found in the balloon, it was most likely referring to the small town of Freehold, New York, which is about 145 to 150 miles “as the crow flies” from Cumberland, R.I. This news item about the letter was not found in the Woonsocket Evening Reporter.